A two-year project that ran between October 2014 and September 2016, funded by the Arts and Humanities Research Council, and run in partnership with the British Library. The successful bidder was The Department of Information Studies, University College London. The output of the project included reports, conferences, talks, twittering, all the usual things you might expect. The final reports were published in early 2017 and included things of interest to indexers and those concerned for the future of them. apparatus of tables of contents and indexes are of particular importance. bibliographic data suppliers, and many others. typesetters) have relatively little experience in enriching their texts to take advantage of the opportunities opened up by digital technologies. para 168 – … (in e-books) readers can benefit from in-text searching as against the manual use of printed tables of contents and indexes that can be highly variable in comprehensiveness and quality. So, indexes are important for the future of academic books, there is still a place for them, however the opportunities of e-books are not being realised at this stage, and sometimes the quality of indexing could be better. The price for copy-editing and indexing 100,000 words is estimated at £2,140. Let’s take a quick look at those prices. Checking the Ubiquity Press site today we find that the guide price has increased by 18.5% to £4,480 for the basic book and £6,900 for the copy-edit and index package. The index page is costed at £880, and copy-editing £1,540, a total of £2,420, an increase of 13%, which suggests the costs of book production have risen more rapidly than those of copy-editing and indexing. Whilst only a guide to authors, I think they are using reasonable estimates and the prices for any individual book may vary. Meeting these costs is an issue for authors publishing Open Access reports as the burden largely falls on individual universities and research institutions as research funding, particularly in arts and humanities, where project grants usually come from a variety of sources throughout the life of a project. Even when authors are not publishing Open Access texts, there will be costs for indexing and copy-editing that they may have to bear, either through the project funding or as individuals. This is one of the reasons why authors may decide they want to index their own texts. However, The Society of Indexers encourages authors to consider using a professional indexer and stresses the indexer’s role as a collaborator bringing professional indexing skills, objectivity and a fresh approach to the topic, that of a potential reader or learner, as well as subject knowledge of the topic. This entry was posted in 2017 and tagged Academic Book of the Future, e-books, indexers, indexes on July 6, 2017 by icemaiden1964. A two-day conference at the Weston Library, organised by Dennis Duncan and the Centre for the Study of the Book, Oxford University. 22nd-23rd June 2017. An opportunity for academics and professionals to meet and and talk about indexes. I must admit to having been slightly sceptical about booking for this event. It was timed to follow on from the Society of Indexers’ annual conference, could I bear to be sitting around for another two days? Who were the speakers, would they all be dry-as-dust old duffers? (With apologies to Oxford dons, I’ve been there and got the t-shirt, I know what they can be like.) Would it all be too esoteric for a jobbing indexer to understand? I need n’t have worried on any count. The lecture theatre in the Weston Library is a great place. The seats are comfy, the tables are welcome, the sound is mostly good and the screen clear. 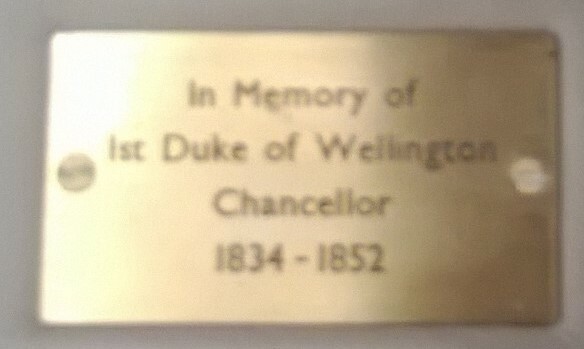 I sat in a chair named after the Duke of Wellington. The speakers were all young academics in the early stages of their careers and they were full of interesting material, delivered in a clear and enthusiastic voices. Young in this context means younger than me. The full programme is available here. You can see the programme covered topics including: indexing in 19th century China, Heidegger and Cassirer, indexes to the Polychronicon of Ranulph Higden, satiric indexes, Richard Hakluyt and the Indexes of Francis Daniel Pastorius. See Paula’s excellent blog for reviews and summaries of the talks here. There really isn’t any point in me covering the same ground. The availability of wi-fi to check out some things as some of the speakers spoke – who were Hakluyt and Pastorius? Why might they be of interest to indexers? – was very useful. The speakers didn’t always have time to give the background that might be obvious to students of old books and manuscripts, but wasn’t for some of us. While some of it may have gone over our heads, I think when we read the articles when they are printed, we will understand more. Two days flew by. The lunches were yummy. Attendees were also invited to the opening of the Jane Austen exhibition at the Weston Library, which was lovely too. A good time was had. Academics became aware of indexers, and indexers were made aware of the range of scholarship which is taking in aspects of indexing. Ruth made a Storify of the event using Twitter tweets, which is here. When can we do it again? This entry was posted in 2017 and tagged bodleian library, book index, dennis duncan, oxford, society of indexers, weston library on July 3, 2017 by icemaiden1964. Society of Indexers’ 60th anniversary conference – sparkling! Why go to a small conference where you know most of the people and you’re all in the same line of business? What’s the point? What will you learn? Who will you meet? Facets of indexing: the diamond anniversary conference of the Society of Indexers was held at St Anne’s College, Oxford on 21 June 2017. Answering the last question first, you will meet people from across the world. The conference was attended by 71 people, 11 of whom gave addresses outside of the UK. The UK attendees represent only about one-sixth of the membership of the society, but were drawn from all over the country. Those from outside the UK included off-shore members of the society, representatives from our sister organisations in the USA, Australia, and the Netherlands, and representatives from indexing software companies. When you’re working away at home, on your own, I think it’s easy to forget that you’re actually part of a global activity. I spoke with an Australian indexer about my experiences working on projects where the volume editor was in mainland Europe, I am in the UK and the production editor is in Canada. She mentioned similar experiences. What will you learn at the conference? The conference covered a range of topics and ran workshops and seminars concurrently. It can be difficult to choose what might be of most use or interest. On reflection, I learned a lot of things about the current state of indexing and better practice. After the welcoming speech we split into subject areas to discuss current situation in our field. In the history and archaeology group we talked about how we tackle issues such as names, alternative international names for events (Battle of Austerlitz or Slavkova? or of the Three Emperors? ), any experiences we had had with producing indexes for e-books or embedding. The opening lecture from Philip Shaw, of Oxford Brookes International Centre for Publishing, on current developments in the publishing industry gave a rapid summary of recent trends, markets and technologies. It’s good to know where you sit in the scheme of things. The conference also covered the AGM business, had awards for services to indexing and new indexers presented by the President of the Society, Sam Leith, and discussed society business. It’s good to keep in touch with the Executive Board, and I was elected to sit on it for three years. So perhaps I’ll learn more about that soon. After lunch I attended Christopher Phipps’ workshop on lives in miniature: indexing biographies and other life writings. One session a year with Christopher is never enough to cover all you might want to ask of him. This year he introduced the idea of a cast of characters in a biography and how you might approach indexing five groups: the main character (the hero or heroine of the book), the lead supporting actors (the family and other significant people), the secondary players who appear repeatedly but irregularly, the walk-on parts who appear with some frequency but don’t say or do much, and the expert witnesses who could be people or significant works by the subject. After a coffee break a number of us discussed working efficiently – tips, tricks and avoiding bad habits. OHIO – only handle it once is something to aspire to in making indexes. Some indexers spend a lot of time editing and working on their entries, others can create an index and spend very little time editing. I suspect that sometimes the amount of handling may have to do with the subject area and the kind of book involved. A text book may lend itself to more OHIO than a biography or philosophy book. Setting targets for time spent doing things is always good advice, as is turning off the distractions and ensuring you have templates for common types of email and other business needs. A collaborative approach involving other indexers or proof readers was also discussed as a way of making more efficient use of your time. We then all met to listen to Pilar Wyman and Pierke Bosschieter discuss how indexers could influence the future of linked indexes in e-books. Pierke is an enthusiastic adopter of technology for reading and has reviewed many formats for e-books and devices. Pilar reviewed some approaches to linked indexes and went on to look at the EPub3 standard and how it could be used for better navigation. As with paper-based indexes of the past, an index in an e-book is part of the marketing strategy of the publisher. Why include it if it is of no use to anyone? Why not make a great one that helps the reader? So the point of going to our conferences is to meet people, learn things and have time to reflect on indexing practice. Here’s Ruth’s Storify if you want to find out more. Next year we’re heading north to Lancaster, concurrently with our sister organisation the Society for Editors and Proofreaders. An interesting time should be had by all. This entry was posted in 2017 and tagged christopher phipps, index, indexing, international, philip shaw, pierke bosschieter, pilar wyman, Sam Leith, society of indexers, st annes oxford on June 29, 2017 by icemaiden1964.